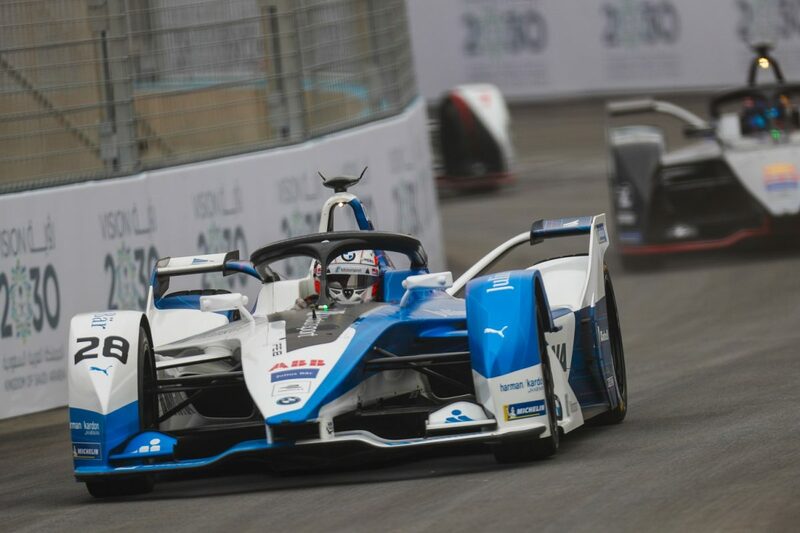 Antonio Felix da Costa has staved off a resurgent Jean-Eric Vergne after a late restart to win Race 1 of the Formula E season in Riyadh. Da Costa crossed the finish line 0.462s ahead of the defending champion after 33 laps under the new time-certain format. Jerome d’Ambrosio also got onto the podium, one position ahead of New Zealander Mitch Evans. Da Costa led the field away from pole in his BMW Andretti entry while Vergne, who started fifth, took over second position when he rounded up Sebastien Buemi (Nissan e.dams) on Lap 9. The Portuguese driver’s lead was over 1.5s at that point and grew over two seconds until Vergne was nipping at his heels at the end of Lap 13. Vergne then pulled off something of a repeat of his pass on Buemi when he overtook da Costa at Turn 18 on Lap 14. His DS Techeetah team-mate Andre Lotterer, who had climbed from seventh on the grid, got by da Costa on the main straight. However, his time in second was short-lived as both Techeetahs were called for drive-throughs due to power limit breaches. That left da Costa with a comfortable advantage over d’Ambrosio (Mahindra) until Jose Maria Lopez (Dragon) stopped on track with broken suspension, which eventually led to a Safety Car. Vergne, who dropped back as low as fifth after his penalty, took the restart in third, at which time he used the new Attack Mode to pass d’Ambrosio. He closed up on da Costa on the final lap but couldn’t find a way by. Behind d’Ambrosio and Evans (Jaguar) was Lotterer, who recovered two positions after his drive-through, while Buemi dropped from fourth to sixth in the four laps after the Safety Car having had to conserve power. Debutant Felipa Massa crossed the finish line in 14th but was issued time penalties for Fanboost offences and ultimately classified 17th. The Venturi driver, who also took a drive-through for a power limit infringement, activated Fanboost too early and used too much energy when he did so. With an extra three points for pole, da Costa leads Vergne by 10 points ahead of Race 2 in Marrakech on January 12. Meanwhile, Evans’ older brother Simon won the inaugural Jaguar I-Pace eTrophy support race in lights-to-flag fashion.